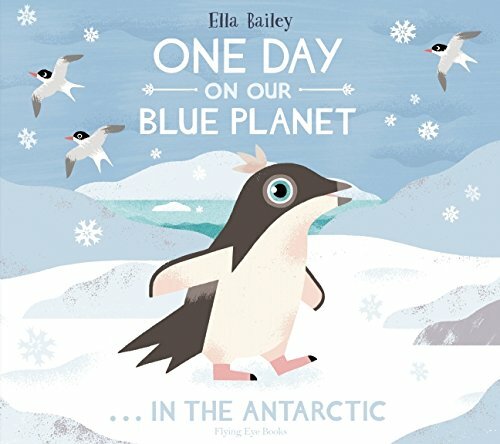 This author/illustrator has already won a fan base for her amazing One Day on our Blue Planet …in the Savannah. Here, the front end papers set the mood with a crowd of flying birds which inhabit the Antarctic. We can spy the wandering albatross, the chinstrap penguin and the imperial shag. At the end of the book we see those creatures which live under the ice in the Antarctic; giant warty squid, the humpback whale and the orca. All are beautifully and accurately drawn and softly coloured. The text centres on an adelie penguin chick which is fed a final meal by her mother before setting off alone across the ice. Whilst she cannot fly, she discovers that once she has traversed the ice and jumps into the water, she is as swift and as graceful as any bird in the sky. Spending each day searching for food, she travels many, many miles, through the open southern waters where giants swim. She travels deep into the hidden world below the ice, finding plenty of krill, fish and squid to eat. If she manages to avoid becoming food herself, it may be years before she returns to solid land. The creatures portrayed throughout are easily identifiable, with reference to either of the end papers. This is a book to enjoy for its entrancing illustrations and simple but accurate factual depictions, appealing to a wide range of youngsters. It is a delight to handle, having a tactile linen-effect cover and strong art paper pages.